For a democratic secular Iran. For peace and prosperity in the Middle East. : No One Would Buy Mullah Flags! 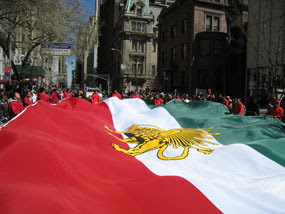 Undoubtedly amongst the Iranian ex-pats, the magnificent Nowruz parade in New York, is a big source of pride and joy. Sadly I have never been able to attend this event but I always follow the news and reports on the parade with much enthusiasm. I came across a report on the NY Nowruz Parade yesterday which I thought was worth a post on my blog. An American street peddler, who follows carnivals and parades and sells flags and whistles and so on, was given a large number of Islamic Republic flags to distribute freely amongst the people by an unknown person. The poor American did not know what the significance of that flag was and what the difference with the Sun and Lion flag entailed for Iranians, and so he was surprised that no one would touch the Islamic Republic flags. My salutations to the patriotic Iranian ex-pats in New York as ever. Nice parade, nice weather, nice crowd ! 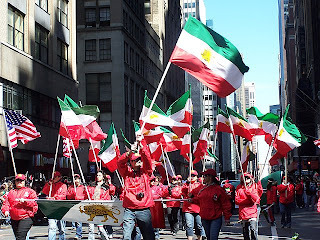 Unfortunately, the NYC parade is also infiltrated by IRI's agents and thats why those flags were there. thanks for the story about Tibet. good job. Regarding New York: I was there in the very beginning when they wanted to do the first parade. The original plan was to just have the tricolors with nothing in the middle of it. Some agents of the IRI were also pushing to have an arial picture of the Persian Gulf with a dolphin jumping out of the water and saying "welcome to the gulf" instead of any flag at all. Finally it seemed like the compromise would be a flag with no lion and sun. At this point I personally threatened to sue the Persian Parade, because I argued that they could not do this as there has never been a time in Iranian history where there was the tricolor without an insignia. So the choice is theirs, either to use the Shirokhorshid, or the IRI insignia - However, I told them, if they chose to go with the IRI flag, then they will have a street war at their hands. In any event it was not at all clear that they would allow the flag, saying they had none. And so a group of Iranians got together and brought their own flags and made sure from that first time that all IRI flags were banned. However, this does not mean that the organizers of the original events were into this. It is just happened that the activists won the day. Thanks for that note Amir and my warmest regards to you for having made the difference. khoshA beh hAle mAme irAn keh farzandi chon tow dArad. Peddler should have let him burn the flags....that would really put the IRI on notice. I love this story. Thanks for sharing! Are there any other options besides the mullah flag and the royalist flag, even though the insignia on the latter is beautiful? Can it stand for a democratic and free Iran? From what I have assumed in the past, I don't see it that way. Sounds like you are misinformed. The Sun and Lion flag has nothing to do with monarchy. For example the MeK or the Iranian Jebheh Melli also use the Sun and Lion flags. You are not suggesting that they are monarchists are you? Or just look at Sattar Khan's commendation certificates to the freedom fighters fighting in the constitutional revolution against the Qajar King, Sun and Lion has been our official flag for many centries until the Islamic revolution banned it.